15 Real-Life Heroes Whose Courage & Compassion Upheld Kerala's Spirit! 15 Real-Life Heroes Whose Courage & Compassion Upheld Kerala’s Spirit! While help is pouring in from all quarters, there are some stories from within the state that will brighten your day. 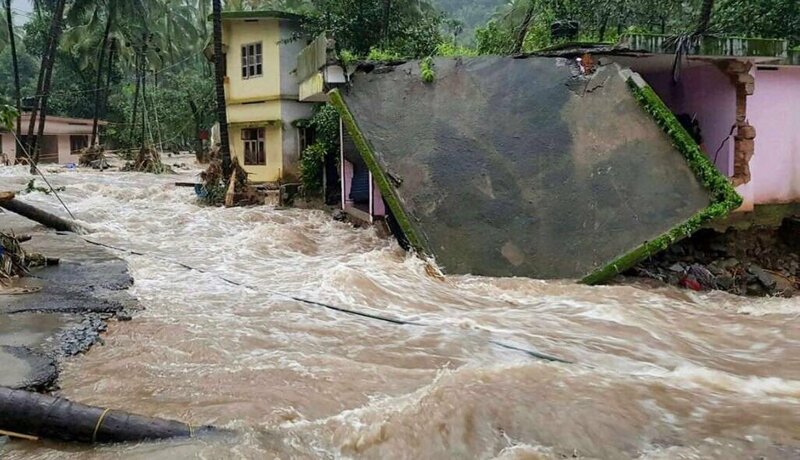 Amidst the deluge and destruction that God’s own Country is being subject to, what continues to emerge are stories of bravery and resilience that the people of the state are showing.The floods, being described as the worst to hit Kerala in over 100 years, push the death toll higher with each day. At the same time, we also get reports of how authorities and commoners are working very hard to help those in distress. In this article we bring you 15 such stories that will most certainly restore your faith in humanity. On August 19, Manoj’s daughter was to be engaged. However given the situation in Kerala, Manoj decided to cancel the function and instead donated the money earmarked for the engagement ceremony to the Chief Minister’s Distress Relief Fund. In a Facebook post, Manoj stated that the decision comes on the back of the “extraordinary natural crisis” facing Kerala, and that the timing of the entire event seemed inappropriate when millions of their fellow state residents are suffering. For a change, a social media challenge is being used for something good. After an overdose of seeing people jump out of cars in the name of a challenge, this comes as a relief. Tamil actor Siddharth, who has been at the forefront of several such campaigns during the Chennai floods and other calamities, has a new one for us all. On August 17, he urged Twitter users to come out and join the #KeralaDonationChallenge. “I dare you. I beg of you! What do I have to do to make you read and share this? I did the #KeralaDonationChallenge It was awesome! Will you? Please? #KeralaFloods #SaveKerala @CMOKerala,” read his tweet. Along with the tweet he also uploaded a rather emotional appeal urging everyone to donate, reiterating the point that every rupee donated will go a long way in re-building Kerala. Residents of Kochi, these two children have demonstrated that to do acts of kindness – you needn’t be of any particular age. Kindness must be practiced, always. Both Harron and Diya were saving money in their piggy-bank to buy a study table. Seeing the situation, however, they chose to donate all their savings to the Chief Minister’s Distress Relief Fund. While the amount totalled to Rs 2210, it is the act that is commendable. Not just this, they also urged their parents to refrain from buying groceries that were not essential. This blanket merchant from Madhya Pradesh is sure to restore your faith in goodness and humanity. An immigrant to Iritty in Kerala where he sold blankets, Vishnu frequently left the state to buy blankets – that he then sold door to door in Iritty. Thanks to his last trip, Vishnu was unaware of the flood situation until he arrived back home. The true extent of the situation was only revealed to him only when he visited the Iritty Taluk office. He then decided to donate the entire stock of blankets he was carrying to the people in a flood-relief camp at Adichukootti Government School, Mangad. Chances are that you have watched the viral video in which a rescue officer is seen running across the bridge with a child in his arms. The clip, after all, became a national sensation. The heroic act was captured in a video by a television journalist and mere moments after Kanayya crossed the bridge with the child, the bridge collapsed! You can watch the video and read that story here. For the fisher community, the sea is their source of livelihood and daily bread and butter. Hence it is not surprising to see them all come out and join rescue operations. Over 100 fishermen took their boats in the flooded streets of Kollam, Alappuzha, Ernakulam and Thiruvananthapuram. They wanted to patrol the cities and help those in distress. What made the fishermen’s rescue mission truly important is the unique design of their boats. They take their boats out on rough tides and flows every day for a living. So they were able to easily raft over the choppy water in Kerala’s flooded cities, accelerated by open dam gates in several places. One particular story that has now gone viral is that of Jaisal K P. A very apt line I read on Facebook is something that certainly rings true – move over Superman, Batman – here comes the fisherman. Jaisal put himself in water so that women and children could use his back as a step to get into the boat. Now, if this isn’t a remarkable feat, I wonder what is. While there are many stories of human intervention and rescue operations, this one is a tad bit different. Rocky, a dog, not just saved himself but also the lives of P Mohanan and his family. In Idduki district’s Kanjikuzhy village, Mohanan and his family were fast asleep in their home, when at 3 am the sound of his dog’s barks woke him up. The man tried ignoring it, but Rocky was relentless. No wonder they are called a man’s best friend. The thought of being stuck without access to medical aid when pregnant is enough to send a woman into labour. Shajitha Jabil, a resident of Aluva, was in an advanced stage of pregnancy when water levels in her area started rising. But quick action by the Navy and in particular, Naval Commander Vijay Varma, helped save not just her life, but also that of her unborn child. You can watch the amazing rescue operation undertaken by Commander Vijay here. With amazing speed, Shajitha was air-lifted and taken to a hospital where she delivered her baby boy. There is no doubt about the resilience the people of Kerala have been displaying. However, this one story of how an elephant was rescued is truly remarkable. A few locals were surprised to discover a stranded wild elephant on a rocky outcrop in the middle of a river. The animal had presumably been swept up there from a different location. The elephant had somehow managed to climb on the rocky terrain but was unable to move out as it was engulfed by gushing water from all sides. The locals alerted the authorities and thus began a 4-hour effort to save the elephant. You can watch the video and read this story here. Both these officers have been personally overseeing the relief operations in flood-hit districts. Not ones to stand around and watch, both these officers themselves started unloading rice bags at the Collectorate for distribution to relief camps. According to some citizen reports, these two officers have been working non-stop without even taking a break to catch up on sleep. Since we have not been able to find the name of this hero, we shall refer to him as just that – Hero. This man jumped into a water stream only so that he could set up a cable wire to send food and other essentials to people stranded on one side. If you watch the video of him swimming against the water current, you are sure to feel goosebumps. Watch the video of his heroic act here. Not only has Tovino been actively involved in the rescue and flood relief work but has also thrown open his home for anyone in need of shelter. He also told several publications that he would be providing all essentials and necessities until the situation is brought under control. This kind deed is sure to win him many more fans. This story will warm your heart. 8-year-old Anupriya is a resident of Tamil Nadu, who after learning about the flood situation in Kerala, decided to donate all her savings to those impacted by the deluge. She was saving the money in order to buy herself a bicycle. You don’t need to be of any age to have a large heart. Known to be one of the largest animal protection organisations in the world, a team of six people have been dispatched to Kerala to help the animals in distress. Stationed in Nilambur and Tirur, the worst affected regions, the team is working relentlessly to rescue dogs, cats and other animals that have been left behind. Read about their rescue operations here. Each one of you reading and contributing in whatever way you can to help the Kerala flood victims is a hero. While there are many who are working on-ground and providing valuable help and service, each of you sitting miles away has also been of immense help and support. The outpouring of help on various social networking sites is truly worthy of mention.